The following is the 7th message that we received in Avalon (England and Scotland) this past June/July 2012 over Solstice. You can find our other messages on our website at www.alunajoy.com under the "Articles for Personal and Planetary Transformation" link. It might be a good idea to read them in order as each message builds upon the previous one. We are sharing this message here with you just as we received it, in present time, with very little editing. We do this for a very important reason. We know that the messages that we receive are not just for our groups, but are for others as well. The Star Elders and all the others that joined us, assure me that the message and the corresponding energy will be transmitted to you as you read them. So as you read this, you might want to imagine that you are with us. Also, always view the photos on the website that we share, as photos also hold some energy of the sites. 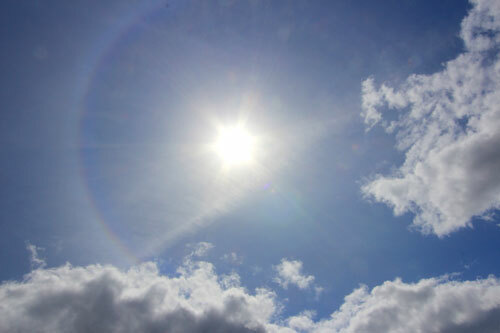 As we enter the site Stonehenge, there is a big sun dog (sun rainbow) around the sun. The Hopi say that a sun dog is an auspicious sign. There is also a magical pyramid cloud formation in the sky. This was the first time I have felt the stones connect with us. This is an unexpected gift. Aluna begins by explaining the basics re: Stonehenge. . . The sun, when it rises on solstice morning, goes through the rock circle on the east side and lights up the Heel Stone (the rock on the west side). This is why the Heel Stone is so important. But just now . . . the Star Elders shifted my perception and helped me realized something. So I hope you can follow this: the Heal Stone solstice marker is working now. The sun in solstice sunrise is illuminating the Heel Stone. This is not a big deal until you place this in the context of what they want me to tell you next. In the Mayalands, the solstice markers are off by a few degrees. This is because the Earth has been shifting on its axis by a few degrees. Even the Japan earthquake shifted the earth a bit. In the Mayalands (like in Dzibilchaltun) to witness the sun rise phenomena, we have to move to one side or the other of the sacred road (sacbe, a sacred road of light) to see the solstice sun go through the temple doorway. 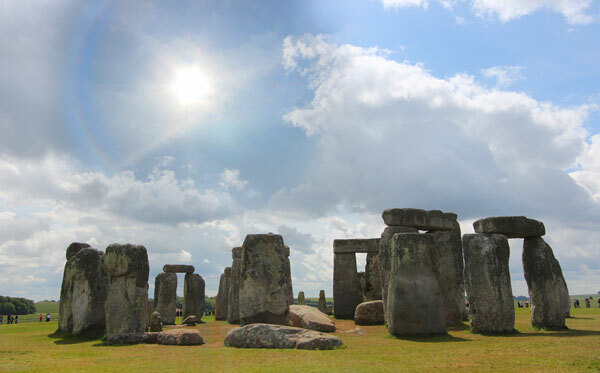 So the question is… WHY isn't the Heel Stone alignment at Stonehenge off as well? Now I am thinking that the Star Elders wanted me to see something. Was Stonehenge built so that it would tell us when the shift of the ages was coming? Now we only just have begun to study Stonehenge recently. So it is possible that hundreds of years ago the sun did not align with the Heel Stone. Did the builders know about the Earth's tilt and changing axis and compensated for this fact? Was Stonehenge built in such a heavy-duty manner that no matter what happened, it couldn't be taken down, so we would know when the shift was upon us? Now, the Star Elders know all of this: they can project and see way out into the future, and only up until the shift that is happening. They knew that Earth would come to this point, yet the Maya sites are a bit off their alignments. The Star Elders and the Ascended Masters can't see what will transpire just after the shift. Nobody can see beyond the shift, so it's very scary for all of us. (laughter). So I think it is auspicious that in recent history we see that the Heel Stone here at Stonehenge has been illuminated by the solstice sun rise. I have seen photographs of the sun shining through the circle and hitting the very top of that Heel Stone at the Midsummer Solstice. So it is working. Many the other sacred sites across the planet are off a little bit. So, I think the Star Elders are trying to show us that Stonehenge is a marker to tell humanity when the shift of the ages is upon us. And maybe in an ancient, distant past, back when Stonehenge was built, the builders knew and intended this purpose for Stonehenge. Archangel Michael pops in and says. . . and this is why they used such big flipping stones - because no matter what, nothing could tear them down. 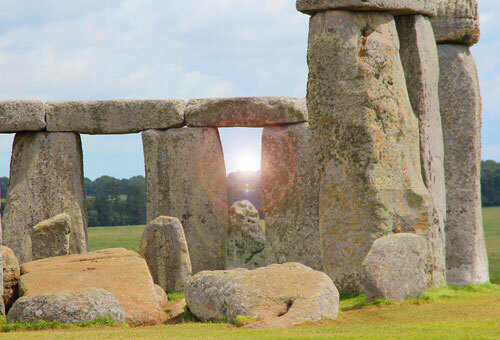 Group Member Carol: I also feel that Stonehenge has something to do with the pivot point. I mean if you think of the North Pole, it used to be a pivot point, so to speak, but now, magnetic-wise, it has shifted. So it sounds like a pivot point. Aluna: What if Stonehenge is going to be the new North Pole? Scientists have been watching the magnetics dropping on the planet, which is another reason why we are feeling whoosy and having balancing problems these days - a little like walking on water. This comes from low magnetics or sometimes from earthquakes. I think what we are feeling here today is a drop in the magnetics, because it's as though I'm having trouble remembering my name. Short term memory is an issue when the magnetics drop. A lot of research has been done about the recent and sudden drop in the magnetic poles. They figured that the magnetics would switch next year but now thought that it might be this last May during the eclipse on the 20th. One researcher was saying that the magnetics were dropping so fast and so radically they expected that the Earth would have multiple poles. So . . . I asked the Star Elders about multiple poles. That sounds cool. Where would they be, and what would that do to us? The Star Elders wouldn't tell me where the magnetic poles would be on the Earth, but I'll bet you Stonehenge is one of them. And this is why thay wanted me to look at the stones in a different way today. I got a chill and goose bumps on that one. Okay, so Stonehenge is going to be the location of one of the new north poles, and then there might be others across the Northern Hemisphere. But if there are multiple poles and our bodies are oriented to four directions, what will it do to us? We will have to learn how to operate with multiple poles which makes us multi-dimensional. So it will be interesting to watch to see if the Earth gets multiple poles and if one of them is at Stonehenge. Also, when I walk into Stonehenge, it usually feels flat as a pancake to me. It is an overused site. We learned about this overuse of a site at Avebury yesterday. We come to Stonehenge because if we didn't put it on our schedule, we wouldn't come. Right? It is like Machu Picchu, except we really go there for Ollantaytambo and Moray. Here we come for Avebury and not so much for Stonehenge. But today the stones are talking to us. They recognize us; I felt a profound recognition. Did you feel that? (the group nodded YES) It wasn't this way the last two times I have been here. A lot of people complain that they don't feel an interaction with the stones here. But this time, we walk in with a sun dog overhead, and I feel it. And say "Oh! They see us." They are hearing us, and they are watching us. I asked Archangel Michael, "What is going on? The stones usually never look at us, and the energy usually is flat as a pancake." I even have been inside the circle with a group, and it was flat as a pancake. "So what is going on today?" And there is a concentration of people here that don't recognize the stones are alive, but the stones are excited that someone is here that can see them. So wave hello to them. (The group waves to the stones, blows kisses and laughs.) They just are happy that we are here. So the stones are recognizing us. As we are walking around the circle now, pay attention to the Heel Stone - that one is my favorite. The Heel Stone is the one on the outside of the circle across the path . . . on the other side. Pay attention to that stone. Then just walk, and look like a regular tourist, and talk to the stones internally: say, "Hello! I am here. I am so glad to be back. I remember you." Have a little conversation, and that opens up the bridge so they can download information that we may or may not understand with our minds. (Those reading this can use the photos to connect to the stones.) We are not going to get information from them through our minds, but through our hearts. I am excited because I have never felt the stones' presence before, but I feel them now. It could be that they are getting ready to download one of the poles here, and the stones are gearing up for the magnetic download. I don't know. That remains to be seen. We will learn more as we go along. Our group walked around the circle and tuned in with the stones. We felt as if we were almost invisible to the tourists, but not the stones. It was a weird feeling. It was like we were in a different dimension from the tourists. Then a disorganized group of druids and dancers ceremony came into the circle to do a ceremony. Stonehenge Heritage Trust allowed this ceremony on this day because on the solstice it was too crowded (they said anyway) . . . or maybe it was that they were a bit nervous letting them do the ceremony in the power of the Solstice Sun. But as the group entered the circle, an odd and surprising thing happened that our entire group felt. We felt the stones shut down, and we no longer felt them connect to us. We left shortly after this occurred. There was no point staying there any longer. We were given our message for the day. We had our window of opportunity. So we walked out sending love to the stones. PS . . . the sun dog disappeared as well.